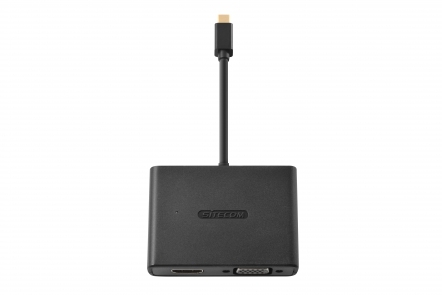 The CN-347 Mini DisplayPort to HDMI / VGA 2-in-1 Adapter from Sitecom lets you connect your Mini DisplayPort devices like a MacBook, MacBook Air, Chromebook or Windows notebook to a TV, monitor or projector that uses HDMI or VGA. 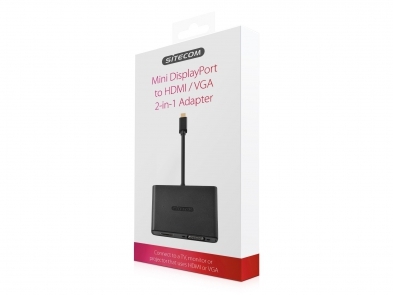 You can also use the Mini DisplayPort to HDMI / VGA 2-in-1 Adapter to extend your notebook’s desktop to a larger screen and increase your productivity or mirror the content to let your audience see what you are seeing. The two-in-one adapter supports a maximum resolution of 1920 x 1200 pixels and provides a crystal-clear viewing experience on every screen.